Our weekend started off perfectly with a little Sushi 101 takeout. We shared three rolls, decided there was absolutely nothing on television that we wanted to watch, and then ended up doing our own thing (i.e. -- I ended up trolling Pinterest with a glass of sauv blanc). Saturday morning we hit the gym together and then loaded up the car for a little mountain escape. Drake got the entire backseat to himself and he was happy as a clam. Our first stop was Char -- a favorite lunch spot. We ordered a couple of beers and two of their sandwiches to share together. Oh my word, the sweet potato fries ... they are absolutely out of this world. We struck up a great conversation with an older couple sitting next to us and just had the best lunch. 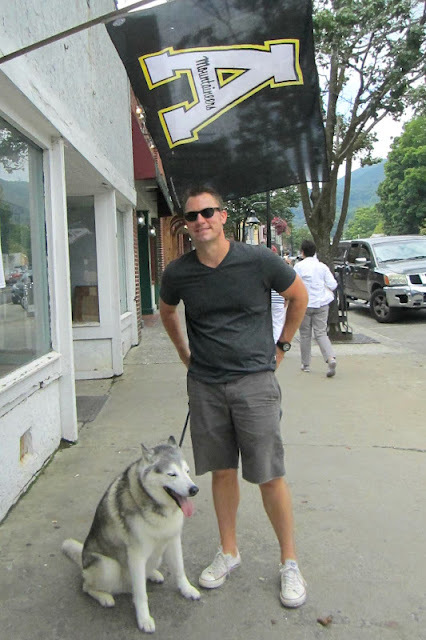 Their patio is dog-friendly and the cooler mountain air was perfect for Ian, Drake, and me. The breeze was even chilly enough that I had to throw a pashmina around my shoulders! 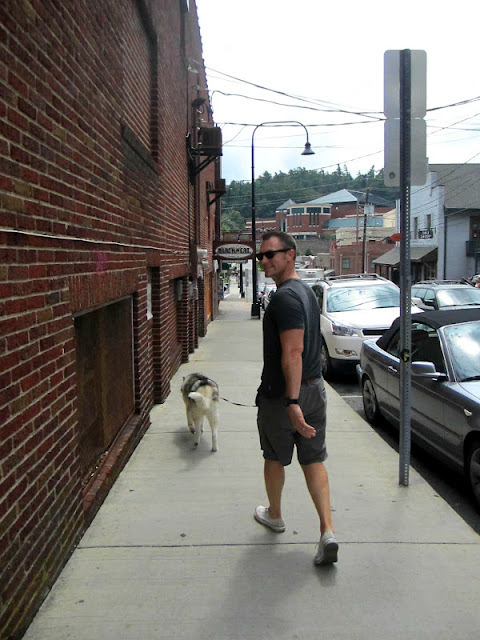 After lunch, we strolled the downtown Boone area with Drake. After a trip into one of my favorite spots -- Antiques on Howard -- we made our way up to the house. Of course we had to make a quick stop at our favorite beverage store, Peabody's, before reaching the house. They have the best selection of interesting wines and beer, and the guys that work there are always so much fun to chat with. Ian recently acquired a new toy which we gave a good run. Sunday evening I did a lot of prepwork for the weekend ahead -- my youngest sister's bachelorette getaway in Savannah, GA. Can't wait to share details! a gun?! - oh my - u go girl tho! -- looks like a fun weekend - Joe and I have been on a sushi craze - nothing beats AMAZING sushi! Can we just go ahead and say that Anabelle and Drake can be boyfriend and girlfriend?? They would make some cute puppies! haha. He's gorgeous! You always seem to have such great, fun-filled weekends! Take-out sushi is sooo great! That sushi looks delicious! Now I am craving! Is that your new top?? CUTE! those are always the best nights - I love eating sushi at home with a glass of wine :) I have only been in charlotte for a year so I haven't made it up to the mountains yet - I really want to! I love towns that have dog friendly areas...Drake looks like hes in heaven! That sushi looks amazing, I think I could eat it even right now and I'm not even hungry. Glad you got a little mountain escape- playing with the hubs toys is always fun! You are so stinkin cute! Love following your fun adventures! Have a great rest of the week! Sounded like a nice weekend! You're going to have so much fun in Savannah, can't wait to hear all about it! Don't you love mountain escapes? Killing time before I go to my rents house... THIRD weekend in a row. If the locale wasn't so pretty I'd go nuts with this wedding planning, haha!